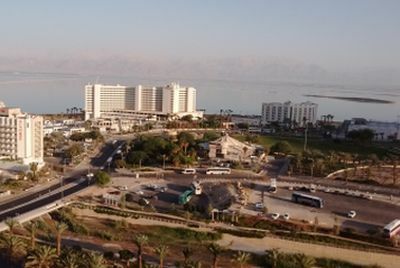 Tourists flock to the Dead Sea. A remarkable thing happened to me last week. I was studying the Book of Ezekiel in preparation for a weekend retreat when a friend forwarded a YouTube clip announcing the most incredible news, which is surely another significant sign of the imminent return of Jesus. One of Ezekiel’s famous prophecies — widely thought to be allegorical rather than literal — is now being fulfilled just as he said it would 2 600 years ago! In short, the Dead Sea is coming alive! Fresh water is now flowing into this Rift Valley expanse that has been unable to support life since the destruction of Sodom and Gomorrah thousands of years ago, useful only for drawing tourists to sample its healing properties while floating unsupported. He said to me: “This water flows towards the eastern region and goes down into the Arabah (the Jordan Valley), where it enters the Sea (the Dead Sea). When it empties into the Sea, the water there becomes fresh. Swarms of living creatures will live wherever the river flows. There will be large numbers of fish, because this water flows there and makes the salt water fresh; so where the river flows everything will live. Fishermen will stand along the shore; from En Gedi to En Eglaim there will be places for spreading nets. The fish will be of many kinds, like the fish of the Great Sea (the Mediterranean)” — Ezekiel 47:8-10. The vision comes amid the latter part of the book dealing with the promised restoration of the Jewish people both to their Land and their Lord. And I believe the “resurrection” of a dead stretch of water reflects a time (near the end of the age) when the fortunes of Israel — long forsaken and persecuted — would be turned around. This is what the world is now witnessing with the Jewish state emerging as a major player on the world scene with a thriving economy borne out of extraordinary innovation. At the same time there is a growing movement of those who believe that Jesus is the long-promised Jewish Messiah, fulfilling the word that when the Jews are finally restored from all the nations to which they were dispersed because of forsaking God’s ways, they would be given a new heart and, as with the Dead Sea, cleansed and sprinkled clean of their sins (Ezekiel 36:24-26). You can be sure that all prophecy of Scripture will be fulfilled to the letter. Around three-quarters of Ezekiel’s predictions (81% of Bible prophecies on the whole) have already been fulfilled with pinpoint accuracy, according to David Pawson in Unlocking the Bible. Take, for example, his prophecy of Tyre’s downfall. The Eastern Mediterranean fishing port would, he said, one day be razed to the ground and thrown into the sea, and the bare rock where it once stood would become a place for fishermen to dry their nets (Ezekiel 26). No other city, before or since, has ever been thrown into the sea, writes author and Bible teacher David Pawson in his masterful work Unlocking the Bible. But when Alexander saw this, he commanded that every brick, every stone and every piece of timber in the city be used to build a causeway to the island, after which his army went across and defeated the people of Tyre. Even today, fishermen’s nets are spread out on the bare rock of old Tyre, just as Ezekiel prophesied, while the modern city is out on the island with sand having silted up against Alexander’s causeway. If it’s in the Bible, you better believe it! 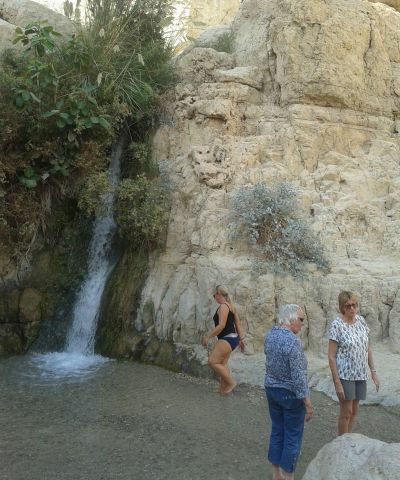 A beauty spot at En Gedi, near the Dead Sea now coming alive. Ezekiel also had a profound impact on my personal life almost exactly 18 years ago when a verse from chapter 9 confirmed to my then new girlfriend Linda that she should marry me! I was widowed at the time and she had asked the Lord for assurance as to whether I was the right choice for her life’s partner, and He subsequently spoke to her heart directly from a rather obscure verse which told of a man clothed in linen who had a writing kit at his side — Ezekiel 9:2. And of course I’m forever grateful for that. I couldn’t believe the extraordinary change in her demeanour towards me when I next called at her home. She had heard from the Lord — and that changed everything! A river of life from God’s throne is also depicted on the last page of the Bible in the Book of Revelation, which is all about what will happen in the days immediately preceding the Second Coming. The biblical symbolism of life from the dead relates both to Israel (see Romans 11:15) and their Messiah. We are living in momentous times that could well usher in the return of our Lord. Watch and pray so that you (and your loved ones) are not caught unawares. thank you. so interesting and informative.